An open house for visitors to learn more about the new cochlear implant services within the Barkley Speech Language and Hearing Clinic, as well as the new Cochlear Implant Research Laboratory, will be held from 4-7 p.m. Thursday, Jan. 24, on the first floor of the Barkley Memorial Center. The event, which will be hosted by associate professor Michelle Hughes and lecturer Josh Sevier, is free and open to the public. Food and beverages will be provided. Any individuals planning to attend should RSVP no later than Jan. 10. 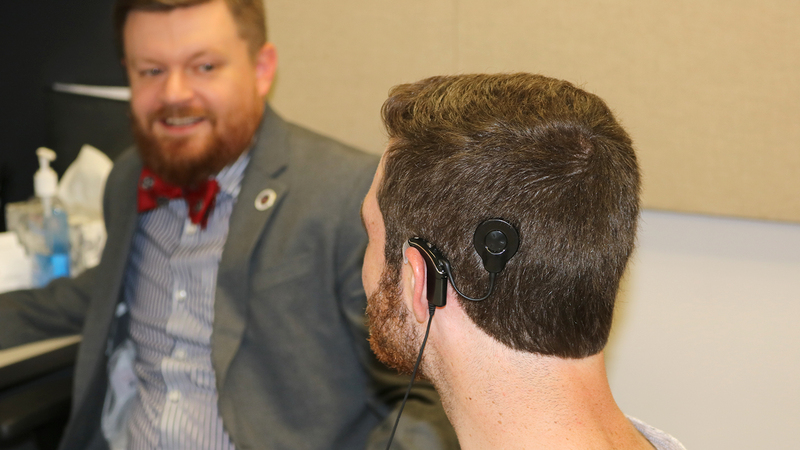 Hughes and Sevier joined the University of Nebraska-Lincoln’s Department of Special Education and Communication Disorders this fall as members of the department’s audiology program. Hughes is the director of the Cochlear Implant Research Lab, where she focuses on two lines of research: physiology as a potential predictor of perception, and telepractice for cochlear implants. She is currently recruiting for four research studies, which can be found on her lab website. Sevier, meanwhile, has begun seeing cochlear implant patients in the Barkley Speech Language and Hearing Clinic, making it the first audiology clinic outside of Omaha to provide cochlear implant services in Nebraska. Other than the actual implant surgery, which will be done in Omaha, individuals will be able to visit Sevier at the Barkley Center for all other evaluations and follow-up care.